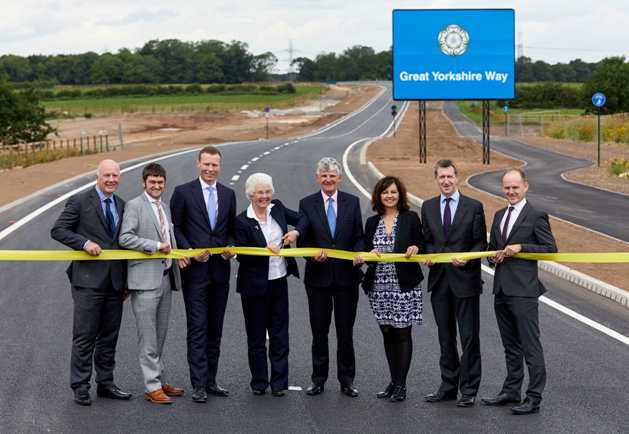 The second phase of Great Yorkshire Way, which completes the direct link from the motorway network to Doncaster Sheffield Airport (DSA), has officially opened to traffic . Delivered by Doncaster Council and backed by the Sheffield City Region, this transformational project completed the last one mile connection from Bawtry Road to Hurst Lane. The completion of the new road also comes on the same day as a new route to Belfast with Flybe starts operating from DSA, a key leisure and business route for the city region. The road has proved a big draw for airlines with TUI recently announcing a 30 per cent increase in seats from DSA for summer 2019, with six new routes including Yorkshire’s only direct long haul service to Orlando Florida. There is now a continuous, high quality route to south east Doncaster from Junction 3 of the M18, reducing journey times for residents and boosting opportunities for local businesses to create more jobs. The second phase will also provide additional cycle and pedestrian facilities linking new residential areas and the development area surrounding the airport to existing routes and the town centre. These facilities will be available by the end of June, after finishing off work has been safely completed. Ros Jones, Mayor of Doncaster, said: “As we had hoped, Great Yorkshire Way is a fantastic success for Doncaster and the wider region. “We always knew its impact would be hugely significant and lead to hundreds of millions of pounds of private sector investment in Doncaster. There are more flights to business and holiday destinations, the old colliery site at Rossington is being reclaimed and people are living in new family homes and finding more job opportunities at the iPort and other developments. “Over 1,400 new jobs and almost 1,000 new homes have been created and this is all due to the collaborative approach we’ve taken to working with our public and private sector partners. Dan Jarvis, Mayor of the Sheffield City Region, said: “For a relatively short piece of road, the final stage of the Great Yorkshire Way will have a huge impact. Directly linking Doncaster Sheffield Airport (DSA) to the motorway network will make DSA far more accessible for people across the region. “Our airport is already seeing success in terms of new routes, rising passenger numbers and an increased demand for cargo facilities. But there is further potential. I know that DSA can be as significant on the east of the Pennines as Manchester Airport is on the west. “To help realise DSA’s potential, I’ve already submitted a bid to the Government’s Transforming Cities Fund. At the heart of this bid is a Global Innovation Corridor that stretches across the region, linking people to key sites including the airport, Sheffield city centre, the Advanced Manufacturing Park in Rotherham and Barnsley’s Digital Campus. Robert Hough, chairman of Peel Airports Group, said: “The road has not only played a huge role in making the airport so easy and stress free to get to but has also helped to bring new airlines and routes to DSA with our main airlines, Flybe, TUI and Wizz Air, now totalling 55 routes. Rob Coldrake, Northern Region Finance Director for TUI UK and Ireland, said: “Our relationship with DSA goes back to day one of the airport, we saw the tremendous opportunity back in 2005 and our ambitious summer 2019 programme is further evidence of this. Lee Tinkler, operations director North, Tarmac, said: “The collaboration and dedication shown by the whole team delivering the second phase of Great Yorkshire Way has been fantastic and meant that challenges faced along the way, some of them unprecedented, have been overcome to successfully deliver the project on time and within budget. The £56 million first phase of Great Yorkshire Way opened on 29 February 2016. It provided a new three mile link from Junction 3 to the A638 Bawtry Road and since opening has been used for almost 14 million journeys. It was funded with contributions from Peel Group, Harworth Group, Verdion, Doncaster Council and the Regional Growth Fund. Doncaster Chamber has been a big supporter of the scheme too. This helped DSA to enjoy its best year of business since opening in 2005. Verdion’s £500million iPort has seen high quality space taken by Amazon, Ceva, Fellowes and Lidl and has also opened its new rail freight interchange – iPort Rail. Housing sites are being developed by the Harworth Group in Rossington and by Peel in Auckley. Removing barriers, creating an environment for growth and improving connectivity for the benefit of residents and businesses were the project’s main objectives. Together with the improvement of White Rose Way, this has been achieved across the town strengthening many existing and new developments. Lakeside continues to flourish boosted by the award winning National College for High Speed Rail and there is great access for over 100 businesses located at Aero Centre Yorkshire, the airport’s 1,600 acre site. Similarly, these improvements enable visitors to continue to enjoy Doncaster’s vibrant variety of tourist destinations including the racecourse and Yorkshire Wildlife Park as well as supporting future attractions like the European Tour Golf Complex at Rossington Hall. An iconic nine metre high Yorkshire Gateway sculpture was installed in April to celebrate the achievements of the link road. It featured in the Tour de Yorkshire coverage which followed the world’s elite cyclists racing along the new one mile stretch of road. The second phase of Great Yorkshire Way cost £10.55million with £9.1million contributed by the Sheffield City Region and £1.45million from Doncaster Council’s Capital Programme. Funding has come from the Local Growth Fund (LGF), which is Government funding awarded to Local Enterprise Partnerships (LEPs) for projects that benefit the local area and economy. Tarmac was the main contractor for the scheme designed by Mott MacDonald and the council’s strategic infrastructure team. Great Yorkshire Way is a central part of the Sheffield City Region Growth Plan which aims to stimulate economic growth and create 70,000 jobs over the next ten years.